I began this week struggling with my addiction. Now, I don’t know if a clinical psychologist would label my relationship with media an addiction, but it certainly feels that way. A compulsion, maybe, would be more accurate. Either way, it occupies a significant portion of my brain space, and it doesn’t feel healthy. Not in the slightest. For the past two years, I’ve had jobs that required a decent amount of time in front of a computer. A common plight for the modern American worker, I suppose. Emails and spreadsheets and dashboards and data entry galore. Because some of those e-tasks can feel mundane or lacking in urgency, and because a whole world of information was at my fingertips, I would occasionally let my discipline slip and open a tab or two (or twelve) in the internet browser. Suddenly, my brain was flooded with the latest news analysis, sports commentary, friend network update, or pop culture critique. I was entertained. I was happy. But not for long, of course. That feeling was fleeting. It was a distraction of empty entertainment calories that made me feel guilty for not focusing on my job, hollow for not contributing anything of worth to the world. So much of modern media is designed to fuel that addiction, however, and I wasn’t strong enough to fight it. Any moment of boredom, or difficulty, or quiet, and I went back. I fed that urge to know what people were saying online, what the latest big thing was, to maybe even add my own witty comment, to play the game. I let myself develop unhealthy mental patterns, and I knew it, and I hated it. I wasn’t present with people, I wasn’t present with my job, I wasn’t doing the hard work to challenge myself and grow. I was stagnating. I thought, I hoped, that changing careers and diving into the unending work of farming would solve this problem. I would fill my brain with all sorts of worthwhile things, and the frivolity would get pushed out. I would grow, learning and creating things, feeling meaning and purpose once again. But it ain’t that easy. Mental patterns have a way of sticking, of perpetuating themselves. Addictions and compulsions have a way of calling to you in a moment of weakness, of luring you back in. Of tormenting you. Even though I was surrounded by stimulating challenges and amazing opportunities, even though I was waking up at 5:45am every morning and working long 12-hour days, the frivolities remained, the distractions persisted. I couldn’t shake the feeling that I wasn’t in control of my own brain, that the desire for those empty entertainment calories was overwhelming my circuitry. I was not changing like I hoped. I realized that my addiction wouldn’t go away on its own, that I had to beat it myself. So, after a sleepless night, I got up even earlier than normal on Monday morning, sat in my dark room, and resolved to do just that. Working with living things, with living systems, is unendingly challenging. I’m beginning to believe that it is also unendingly rewarding. 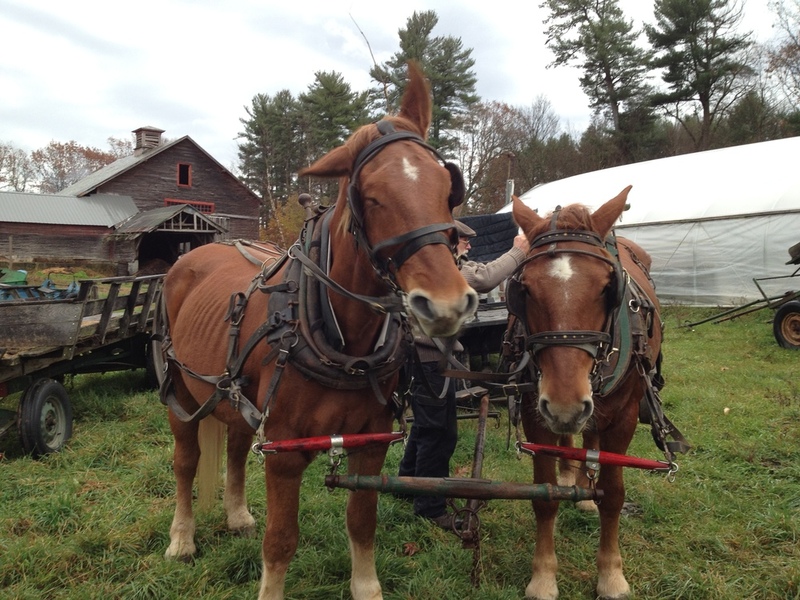 On Thursday and Friday, along with a few other students, I went up to Fair Winds Farm in Brattleboro, VT, to participate in a two-day draft horse workshop with Jay and Janet Bailey. We practiced being driven around blindfolded, with two strings slung over our shoulders, nothing to guide us but subtle tugs and one-word cues. We learned the proper hand position for driving a team of horses - holding tension, taking it in, and letting it back out, all in what amounted to a graceful dance - with our lines clipped around a barn post. We walked the massive Suffolk horses - Charlie, Robin, Phoebe, and Jess - out of their stalls, put on their harnesses and bridals, and drove them down to the yard. We practiced our verbal and tactile commands by weaving them around obstacles, by dragging a log around the greenhouse, by hitching them to wagons and driving them through the woods and across the fields. It was actually quite easy, and yet also somehow maybe the hardest thing I’ve ever done. These horses are intelligent creatures that’ve been clearly well-trained. They turn their ears to listen for your command, they look you in the eye to watch for your cue. They know when it is time for work, and they focus on the task at hand. They very much want to do what you want them to do. And yet, they also have personalities, they also have occasional difficulty suppressing instincts or yearnings. They will test you without warning, refuse to listen, resist the turn you need them to make. They will feel for your inattention, your loss of focus, your distraction, and take full advantage. To work with horses, we found out, you have to slow down your mind, be fully present, and listen to everything they say. Otherwise, communication is impossible. It is an extreme test of patience, of focus, of discipline. Every false step or hesitation communicates something to you, every gentle tug or release of the shoulders communicates something back to them. You think everything’s going great, so you start thinking passively about dinner or the movie you’re going to see or the friend you need to call, and then the horses have turned the cart around before you could react. Jay and Janet have been running their farm with horse-power for 34 years, and they will tell you that the learning, the listening, the focus never ends. It is a lifetime of effort. It is simply part of the work. I always hesitate to say what “we need”, but it seems to me that we need to work more often with living creatures, with living systems. I could argue that we need to do this because we rely upon them, that we are a part of living systems, and that all human efforts to dominate or circumnavigate living things will ultimately result in failure. Maybe that’s true, maybe it’s not, maybe it’s impossible to tell. But either way, that’s not where my time with draft horses took me this week. Instead, I thought endlessly about the spiritual and intellectual benefits of this work. When working with living things, we are engaged in a partnership, in an exchange. It might not be equal - though I don’t know how that would ever be measured - but it is a partnership nonetheless. We do not control everything that happens; we are but actors within a larger play. There are a lot of other things going on. Working with living things requires us to slow down, to purge ourselves of distraction, to focus on the task at hand, and to listen. It is difficult, and it requires every part of us. I can easily imagine myself working with horses, but I don’t know if it’ll ever happen. What I do know is that I never want to stop working with other living things, be it soil or vegetables or sheep or cows or my children or my friends or my partner. They may be hard or complicated or quirky or imperfect, but that's the stuff with which incredible things are built. They are more than worth the trouble. And through them, through that work, maybe I can build myself, too.